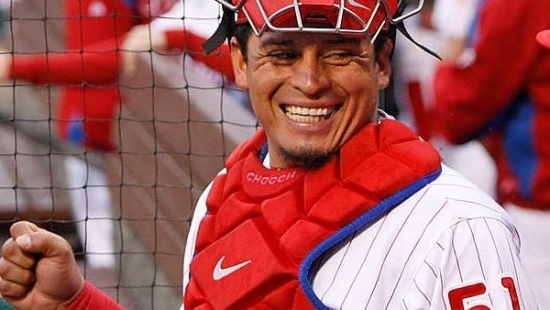 Longtime Philadelphia Phillies C Carlos Ruiz has been traded to the Los Angeles Dodgers for catcher A.J. Ellis, minor league RHP Tommy Bergjans & a player to be named later. Ruiz was first signed by the organization in 1998 and made his major league debut in 2006. He was a core member of the teams that won 5 straight NL East titles from 2007-2011, including the 2008 World Series and 2009 National Leage penant. In 2008, he hit a walk-off single to win Game 3 and was behind the plate to catch the final strike of the World Series. He is also only one of two catchers to ever catch 4 no-hitters, including Roy Halladay's perfect game and post season no hitter, Cole Hamels' farewell outing, and the combined staff no-hitter by Cole Hamels, Jake Diekman, Ken Giles, and Jonathan Papelbon. Carlos was named an All-Star in 2012. Ruiz is not only a fan favorite, but he's a clubhouse leader, and one of the best staff minders and game-managers in the game. Over the years he's worked with some of the best pitchers around (Cliff Lee, Roy Oswalt, Roy Halladay, Cole Hamels, etc.) and they all have sung praise for his preparation and work behind the plate. This trade is for him, one more chance at another ring with a contender. The Dodgers fans are saying some similar things about A.J. Ellis who will be coming our way. Ellis may not have the bat that Ruiz has, but he apparently has the right clubhouse presence. A strong veteran leader is always welcome. Their ace Clayton Kershaw (though still on the DL) will miss his personal catcher. Chavez Ravine keeps filling up with ex-Phillies including Utley, Rollins, Victorino, Blanton, Ruiz, Davey Lopes.